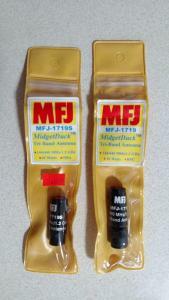 Offering a New MFJ-1719 or MFJ-1719S Tri-band Midget Duck for 2 meters, 440MHz, 900MHz and 1.2 Ghz for $14.50 ea. plus $6 shipping. The MFJ 1719 is 1 3/4 in long and has a BNC connector and the MFJ 1719S is 1 1/2 in. long with a SMA connector. Both antennas are rated at 10 watts. If you have any questions please feel free to call.